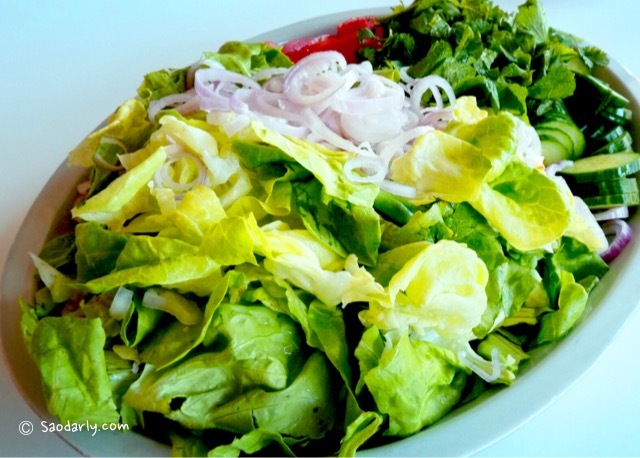 Having Yum Salad (ຍຳສະຫຼັດ; ຍຳຜັກສະຫຼັດ) for dinner. This is a salad with egg and chicken dressing over lettuce, tomatoes, cucumbers, mint, coriander, and shallot. 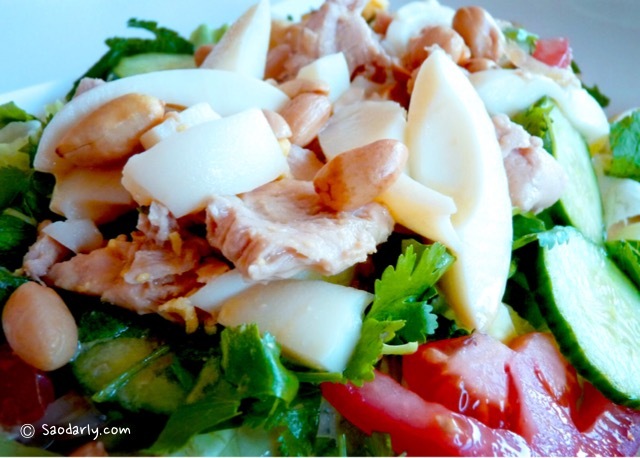 The egg and chicken dressing is quite simple to make. I cooked one sliced chicken breast with two tablespoons of oil with garlic. Then I added some water, egg yolks from five hard boiled eggs, season with salt, sugar, fish sauce, and soy sauce. After waiting for the dressing to cool down, I added lime juice and sliced egg whites. The dressing is then poured over the salad ingredients and gently mix together. 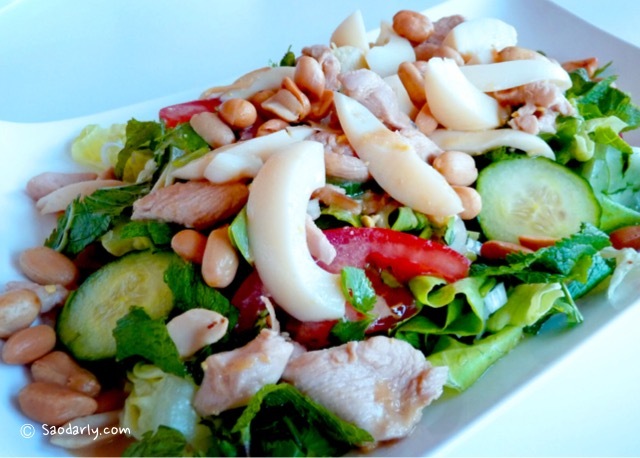 Yum Salad is quite refreshing and delicious with plenty of roasted unsalted peanuts on top. I don’t use measuring tools and didn’t take any cooking lesson. So, it’s play by ear and adding a bit of this and a bit of that until I like the taste of the food. I know you have to dissolve the hard egg yolk in some hot oil and then add some fish sauce, no? please tell me. 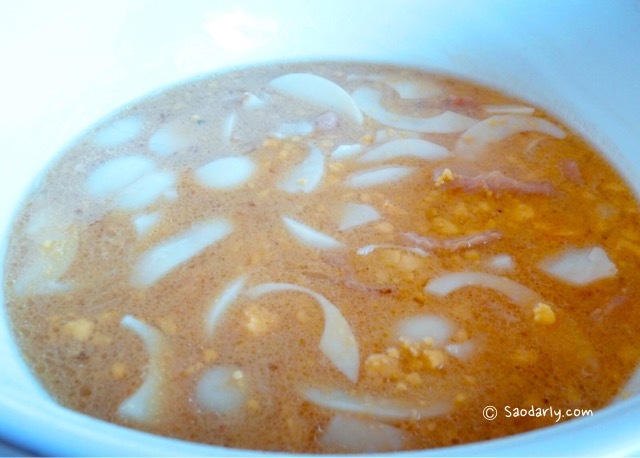 Please try the recipe, posted by Vincent, Lao Salad Dressing (Nam Chim Lao Pak-salad). I’m Laotian, living in Portland, Oregon. I enjoyed reading about your travels to Laos and reading your recipes. I love eating Lao food, but I’m a horrible cook. This summer I will take my two kids to Amsterdam for a week. Could you recommend some good Asian restaurants? Is there any Lao restaurant? I’m happy to hear you enjoyed reading my blog. Portland is a very nice place to live and I have many relatives living there. I have never been there to visit my aunts but hope to be there in the future. I haven’t been to Amsterdam since 2006 but when I go there I usually eat non Asian food and when I do I go to Bird restaurant, which is a Thai restaurant for dinner. For lunch, I also grab a bowl of Pho at Bird snack bar, opposite of Bird restaurant. There is no Lao restaurant that I know of in this country but many Thai restaurant owners are from Issan. Here is the list of recommended places to eat in Amsterdam from a Dutch website that I check for where to eat, with good ratings. Recommended Asian restaurants from a guide book that I bought for my first trip to Amsterdam. Krua Thai, Treasure (Chinese), De Kooning van Siam (Thai), Swaagat (Indian), Speciaal (Indonesian), Dynasty (Asian), An (Japanese), Tom Yam (Thai), Sea Palace (Chinese). Enjoy your trip in Amsterdam. There’s plenty to see and do there and be sure to do the boat trip through the canals. I’ve done it like three times and still want to do it again. Thank-you so much for taking the time to write back with the restaurant recommendations. I really appreciated. Let me know if you get a chance to come to Portland. I’ll take you out to lunch or dinner. Portland has many good restaurants.